It helps to read the fine print, or rather the press release. My first impression of Jennifer Steinkamp's installation show at Lehmann Maupin gallery was not too great. In one room, video projections on the wall look like the backscreen, lava lamp imagery at a '60s psychedelic happening. 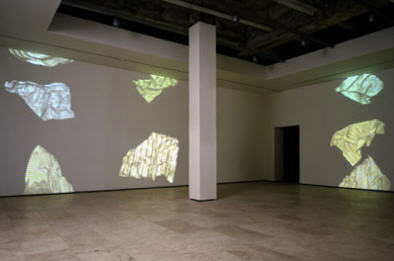 In the another room, images of floating fabrics cascade down the walls. The first installation, called "The Wreck of the Dumaru," becomes more interesting, however, when you learn that "the work references to her great uncle who became delirious and died at sea during World War I." 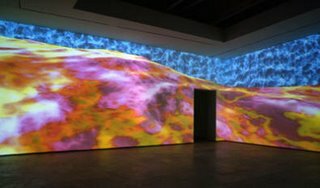 The fabrics work is computer-generated and looks it, which somewhat takes away from the artist's intent to study the "illusion of the virtual."